Published in the Dover Express, 7 March, 1980. Limekiln Street bounded the north-western side of it, and on its northern corner, just below Finnis's Hill, was the first quay constructed for landing merchandise. Limekiln Street was narrow owing to the small area of land that was available between the cliff and Dover’s original western harbour. Importance was attached to this thoroughfare owing to the making of the Old Folkestone Road at the back of Shakespeare and Abbot’s Cliffs, placing it, so to speak, on the world’s highway. When the Wesleys came to mission Dover in 1760, after vainly trying to get a satisfactory footing up town, they turned their attention to Limekiln Street, where two dwellings were obtained and used as a meeting house. In the year 1790, they left the old place, and Mr, John Wesley officiated at the opening of Dover’s first regular Wesleyan Chapel in Queen Elizabeth Square. The site of this Chapel was on the Limekiln Street side of Holy Trinity Schools. Before the South-Eastern Railway came to Dover — the first train arrived on February 7th, 1844 — Limekiln Street was not only the direct route to the Folkestone Road, but also to the pleasant western beach. The making of the railway obstructed that way to the sea, but Limekiln Street was a short cut to the railway terminus. The coming of the London and Chatham Railway made great changes in Limekiln Street. From the “Paris“ Hotel (which stood near the Packet Yard) along to the Oil Mills, the space under the cliff was mainly occupied by workshops and factories. On the seaward side some twenty houses had to go when the railway cut through old Limekiln Street to reach its terminus, the Harbour Station. Prior to this railway making, which was completed in 1861, Limekiln Street was joined to Snargate Street by a fairly level road. This was replaced with a steep gradient, which was also very crooked, as a result of the bridge made over the railway, the road first pointing into the Oil Mills, and then turning off suddenly in the opposite direction. The bridge built at that time was of 63ft. span, and was 24ft. 8ins. between the parapets. In connection with the Viaduct Scheme a larger bridge was provided for, and this, built by Messrs. Pearson and Son in 1922-23, was opened on June 15th of the latter year. It is a steel plate girder bridge with a span of 75ft., and is 45ft. wide between the parapets. There is no brewery now in Limekiln Street; Satchell’s, which was a large affair, was dismantled nearly 100 years ago. Mr. Thomas Grant, the distiller, carried on business successfully here, and originated Grant's cherry brandy, later made at Maidstone, Holy Trinity Vicarage was for many years at No. 11, Limekiln Street. 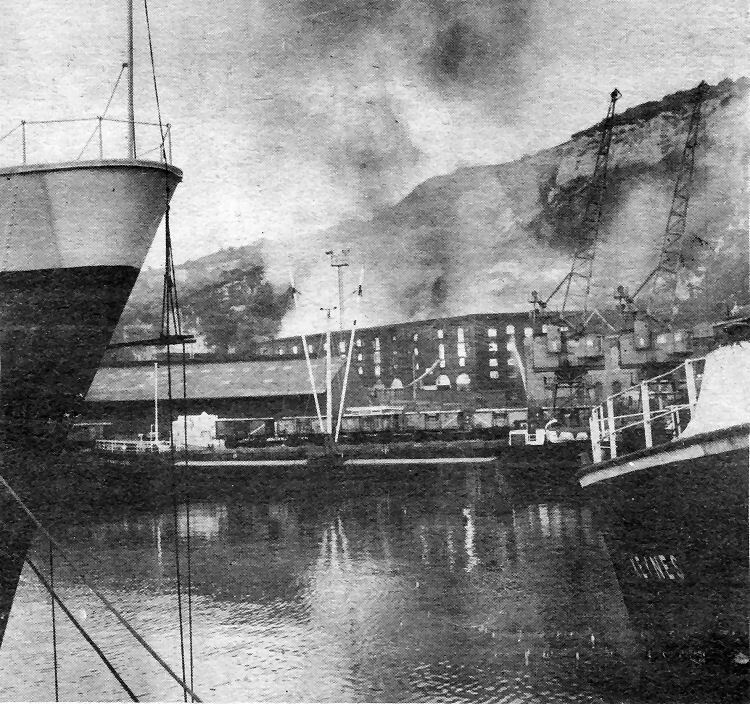 Several factories were put out of action when a mystery £1 million fire swept through Commercial Buildings — the old oil mills — pictured above from across the Granville Dock, in May 1965. The Limekiln Street blaze was the biggest this century. Flames shot over 100 feet into the air as 50 firemen, hosing up to 1,600 gallons a minute into the building fought a 10-hour battle to control the blaze. Destroyed, however, were the factories of Geraldine Fashions (Fur Fabrics! Ltd., Cellofoam Ltd and Glynne Robinson Studding Company together with offices of Alma (Dover) Ltd — shipping agents — and stores of Court Bros, Gheysens and GPO Telephones. The five-storey building, which had a chequered career, was eventually demolished and Hammond’s warehouses built on the site. During the last war the building was used as a transit camp for troops. Today the Pier District, as the western docks area used to be know, is bereft of any really old houses. But before the last war which led to clearance of much of the area it was a different story. 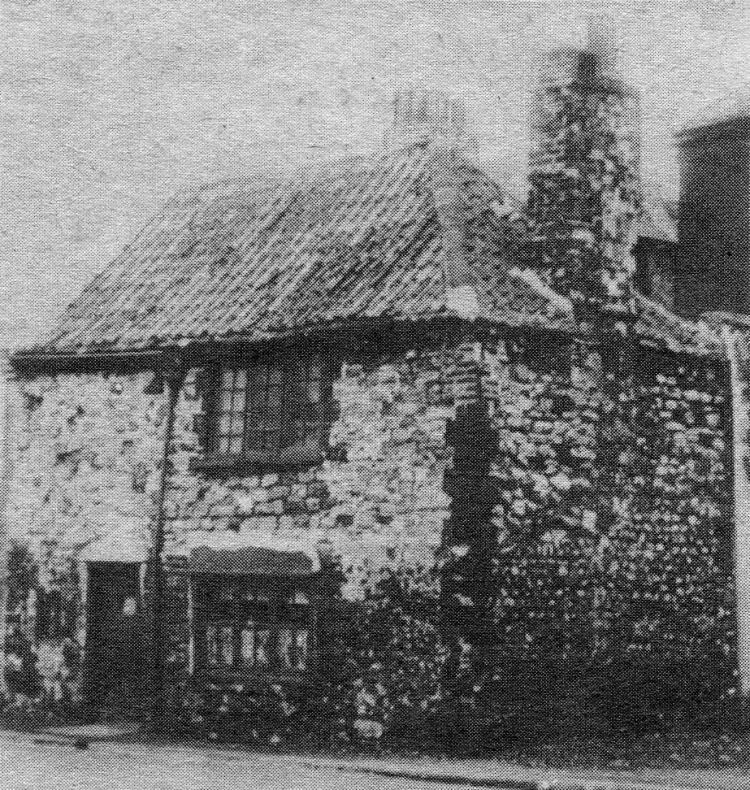 This ancient cottage stood at the west end of Beach Street and was photographed by Amos & Amos in 1912.